And here is something new! 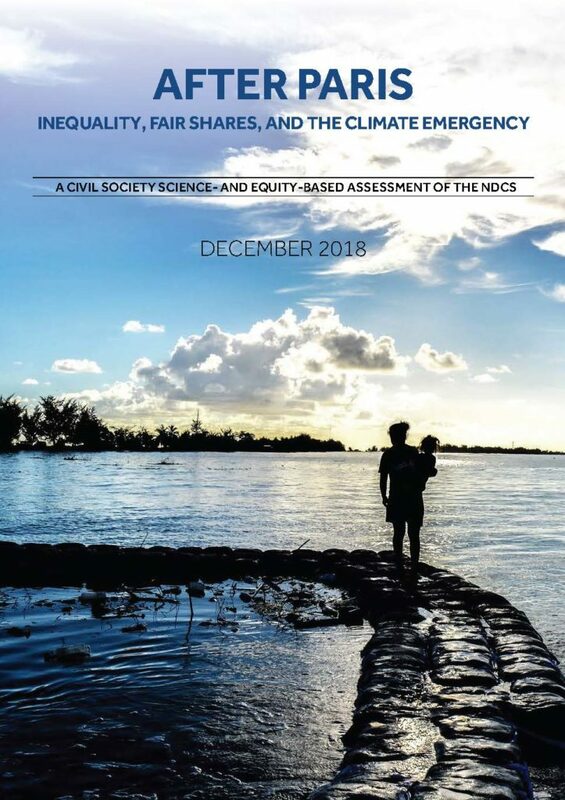 A report that evaluates the current national pledges of action in the light of the IPCC’s bracing new report — Global Warming of 1.5°C — and in the context of an analysis that takes inequality within countries just as seriously as it takes inequality between countries. The report is titled After Paris: Inequality, Fair Shares, and the Climate Emergency, and it has an extremely impressive list of organizational endorsers, from all over the world. Which is not surprising, as it was produced under the aegis of the Civil Society Equity Review coalition, which has built quite a bit of momentum at this point. EcoEquity, as one of the partners in the Climate Equity Reference Project, is one of the principle authors. One of our partners even call this report “elegant,” which is something for this sort of a report. Take a look! I was in Katowice when a busload of NGO people went to Auschwitz. Alas, I could not go. I had a meeting I couldn’t skip. Seriously. But Tzeporah Berman went, and it seems that she can write as well. This is her report. The drama was high in Katowice when a rotten bloc of four countries — the Saudis, of course, and also the U.S., the Russians and the Kuwaitis — refused to welcome the IPCC report. But it wasn’t the drama that made the fight an important one. It was that the Saudi’s argument. . .
. . . has definitely passed its use by date. Read more here. Climate politics can be brutally difficult. You have to tell the truth, for one thing, but if that’s all you do, you lose. The real trick is telling the truth in a helpful manner, one that opens doors. 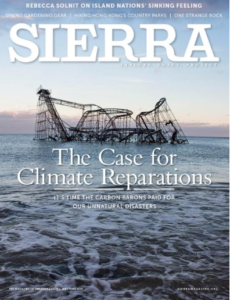 So kudos to Jason Mark, the Editor-in-Chief of Sierra Magazine, who pulls this off nicely in The Case for Climate Reparations, the cover story of the current issue. The subtitle, “It’s Time the Carbon Barons Paid the Costs for our Unnatural Disasters,” signals the secret of Mark’s success. He’s asking for something real, but he’s not asking for the world. This is the Transitional Justice way. Reparations are just one tool in the toolkit, one device among many. The real challenge is to face history, and to do so in a meaningful way that makes it possible to then move forward. But, again, Mark is making a measured case. He’s not even naming the great challenge of “differentiated responsibilities” a phrase from the United Nations Framework Convention on Climate Change that, overplayed in decades of often bitter negotiations, has left the realists terrified of equity in any form. Quiet conveniently terrified, actually. He’s just talking about the fossil corporates, his “carbon barons,” and suggesting that it’s their time on the block, their time to face history. The Sierra Club should be congratulated for this piece. I hope they don’t have to put up with too much carping for running it. Because the truth is that, unlike the challenge of mitigation — which can to some degree be met with technology, and market mechanisms, and policy reforms — the challenges of adaptation and loss & damage are absolutely going to elude the devices of politics as usual. When the waters rise in earnest, and they will, when the deserts spread and intensify, and they will, the question of responsibility is going to hang heavy in the air. In fact, it already does. And facing it in a helpful way is going to be hard. But, hey, we gotta start somewhere. Why not with the fact the Exxon lied? Oil Change International, the very model of an activist climate think tank, has released an excellent critique of the International Energy Agency’s (IEA’s) climate scenarios. It’s called Off Track: The IEA and Climate Change, and it’s well worth your time. Also note that the principle author of the report, Greg Muttitt, has recorded a concise webinar version of the report which is archived here. This is pretty technical stuff, but if given that the IEA’s New Policy Scenario is one of the most influential climate / energy projections in all the world, and given that it is massively inconsistent with the Paris temperature goals, it’s also pretty important. Just one specific point. The IEA not only has its New Policy Scenario, it also has its so-called Sustainable Development Scenario, and even this latter scenario is nowhere close to being consistent with the Paris temperature goals. Moreover, the IEA’s conception of this more stringent scenario is nowhere close to being equitable. This graphic, from the Oil Change report, makes this clear. 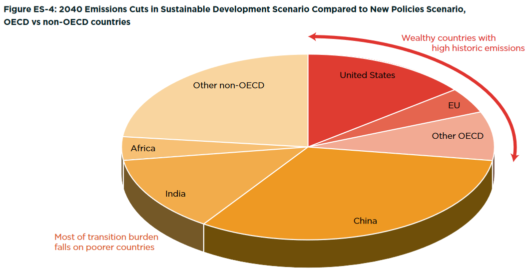 It shows that, in the IEA’s view, the bulk of the reductions that need to be made if we’re to increase ambition from the from the New Policy level to the Sustainable Development level, should be made in the developing countries. If this is what passes for realism in the IEA, we’ve really got a problem. The Civil Society Equity Review coalition came together before Paris, to draft and released the Civil Society Review of the INDCs. At the end of 2016, it released its second report, Setting the Path towards 1.5C. 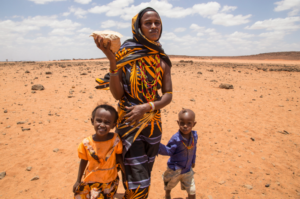 The Climate Equity Reference Project is a long-term initiative to provide scholarship, tools, and analysis to advance equity as a practical means to achieve an ambitious global climate regime. The Climate Equity Reference Calculator allows users to define their preferred approach to “common but differentiated responsibilities and respective capabilities,” and then to explore the implications. A 2 degrees C rise would be catastrophic, and avoiding it requires radical change and climate justice. Click here for Tom Athanasiou’s review of the IPCC’s Special Report Global Warming of 1.5ºC, as published in The Nation. Also, the Nation article was followed by two interviews with Tom. The first was a Nation podcast, and the second was on Terra Verde.